CNR Food Istanbul is ready for visitors in 2019! Excellent Buyer Delegation Program at CNR Food Istanbul! Get ready for a delicious food heaven! 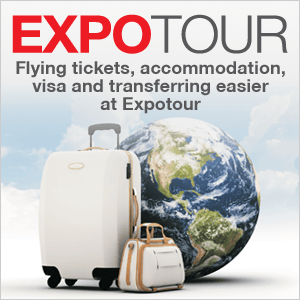 Expand your export volume with Food Istanbul! A great number of exhibitors received orders fulfilling their annual production capacity at CNR Food İstanbul on the first day. As per the statement for CNR Food İstanbul, the exhibition which is organized with the aim of becoming the largest food fair of the world broke the record for foreign buyers in the first two days. CNR Food Istanbul is organized to increase the export rates of the food, packaging, and food service products industries. The majority of the exhibitors received orders fulfilling their annual production capacity on the first day of the exhibition. In her written statement, Erem expressed that the exhibitions are organized with the motto “more exports” and that the exhibitions held in 2018 were extremely fruitful. Erem expressed that foreign buyers and buying committees played a big part in the success of the exhibiting companies who made hot sales and established new business connections at CNR Food İstanbul. Erem said that as a nation we need to unite to prosper in a time when the fluctuations in foreign currency rates have caused a global economic distress, adding that CNR Holding endeavors as a family of 850 employees to ensure the prosperity of Turkey. FOOD Istanbul Expo was held between the dates of September 05-08, 2018 at CNR Expo Yesilkoy, with the aim of being the largest trade platform of the Turkish food industry. 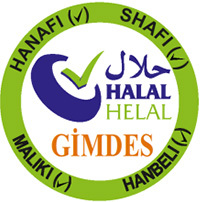 CNR Holding continues to expand with “FOOD Istanbul Expo” which was previously organized under the well-known name “CNR GIDA Fair”. Turkish food and beverage industry, which maintains its remarkable position with productivity and dynamism, achieved success in the past decade by having a share of $300 billion in total GDP and over 400,000 labor force in 40,000 corporations. FOOD Istanbul Expo offered a global b2b meeting platform for visitors to explore the latest developments in the industry. The fair took place on a unique business platform, creating a supportive environment for companies to increase their strength in global competition. 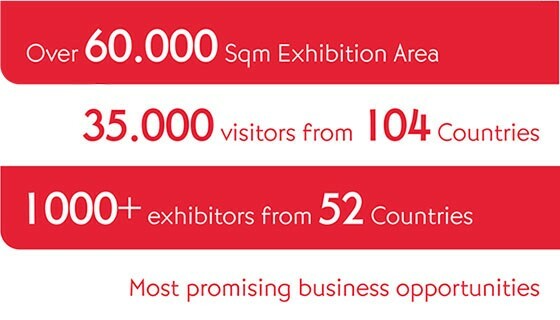 The exhibition was held on 60,000 sqm with more than 1,000 brands, targeting 35,000 professional visitors with the support of the Istanbul Exporters Association. 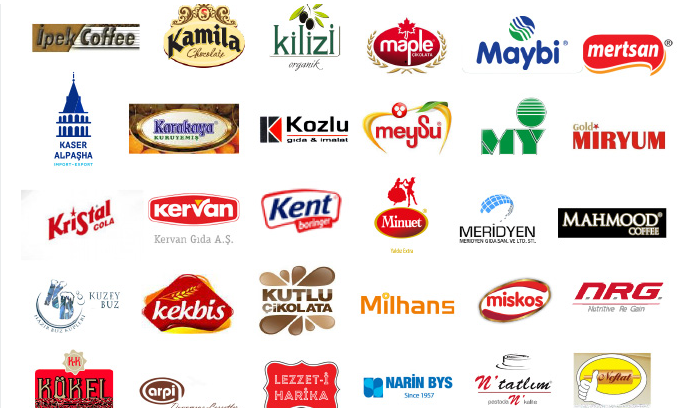 Professionals of Food and Beverage industries from Europe, Middle East, North Africa, Russia, and Balkans, creating new business lead opportunities for the Turkish industry. CNR Food İstanbul was even more colorful this year with the participation of India. Considering the reputation of Indian products, India Trade Promotion Organisation was be a significant factor in promoting innovation throughout the food industry, locally, regionally and globally. In this dynamic environment, CNR Food Istanbul offered a unique and informative commercial platform for industry professionals, where they could keep up to date with the market trends. CNR Food Istanbul 2018 opened its doors to a colorful atmosphere with the participation of different countries from around the world on 05-08 September. CNR Food Istanbul made a remarkable impression as a compelling alternative to the global food exhibitions organized in different countries on similar dates. The Czech Republic, India, Malaysia, Uzbekistan, China, and Russia are among the countries that added significant value to the exhibition by bringing their tasty products together with the industry professionals. The country pavilions created excellent opportunities for all the companies to integrate into international markets while introducing different flavors. CNR Food Istanbul was even more colorful this year with the national participation of the Czech Republic. All the Czech exhibitors presented their newest products together with industry Professionals during Food Istanbul 2018 adding a significant value to the entire show. The Czech Republic National Pavilion is organized under the patronage of The Ministry of Agriculture of The Czech Republic. Given the high reputation of Czech products, the Czech National pavilion was a key driver in fostering innovation across the local, regional and global food and beverage supply chain. 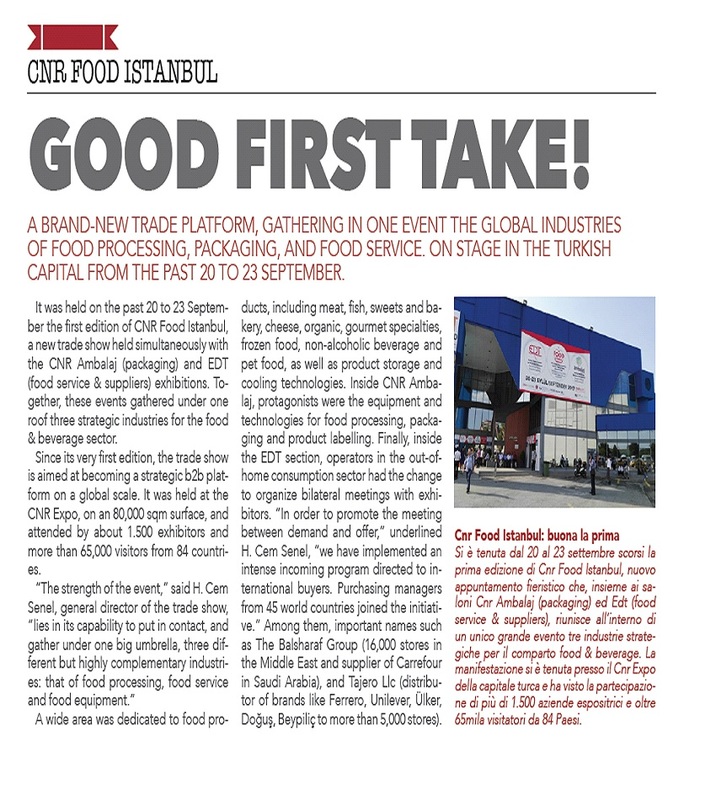 In this dynamic climate, CNR Food Istanbul continued to empower the global food and beverage community as an unmatched trading and knowledge platform that offers unrivaled market overviews and insights to industry professionals. We will be pleased to welcome you at CNR Food Istanbul which will be held on September 05-08, 2018. The Show will play an important role in facing major market challenges and enhancing the dynamism of the food industry focusing on the future of the sector in the Eurasian Region and in the world. Don't miss any trends and innovations at CNR Food Istanbul! CNR Food Istanbul 2018 will play an important role in facing major market challenges and enhancing the dynamism of the food industry focusing the future of the sector in the Eurasian Region and in the world. FOOD ISTANBUL has prepared a special HOSTED BUYER PROGRAM by supporting with Turkish Ministry of Economy and Istanbul Exporters' Association, where all exhibitors would get the chance to explore the latest developments and have the general outlook of industrial diversity. CNR Food İstanbul, supported by Ministry of Economy, provides unique commerce opportunities to exhibitors. The exhibition will be held on September 5 – 8 2018 at CNR EXPO Yeşilköy. CNR Food İstanbul is the only platform where the food & beverage, processing, storage, cooling technologies, logistics and store equipment industries under the same roof. If you would also like to exhibit in CNR Food Istanbul, organized by CNR Holding subsidiary İstanbul Fuarcılık with the support of ETÜDER, and TGDF, contact us. CNR Holding and The Federation Of Food & Drink İndustry Associations Of Turkey (TGDF) joined forces for CNR FOOD İstanbul. Kopuz said, "As food industry, we’re one of the most important industries that bring in foreign currency to the country. TGDF supports CNR Food exhibition because CNR works to increase the profit and export rates of the Food Industry. In the food industry, the trust throughout the value chain is expressed with the phrase, “From field to fork”. The relation between food and health is indisputable. If the food you eat isn’t healthy, you can’t have a healthy life. In this day and age, the importance of food safety increases. All the innovations and variety in the food industry will be shared with the visitors at CNR Food Istanbul, displaying the whole process. The exhibition will create a platform where the competitive power of the food industry will increase in the international market with innovative, reliable, high-quality solutions which will add value to products. Food İstanbul will combine the experienced team of CNR Holding with the power of international network, offering visitors the opportunity to witness the process of the food industry. CNR FOOD İstanbul maximizes the export target of the industry! CNR Food Istanbul Exhibition, organized by CNR Holding subsidiary İstanbul Fuarcılık with the support of İİB, ETÜDER, and TGDF, will host a great number of domestic and foreign visitors. CNR Food İstanbul Exhibition, supported by ETÜDER and TGDF will host domestic and foreign visitors, uniting the most important representatives of the industry on September 5-8, 2018. 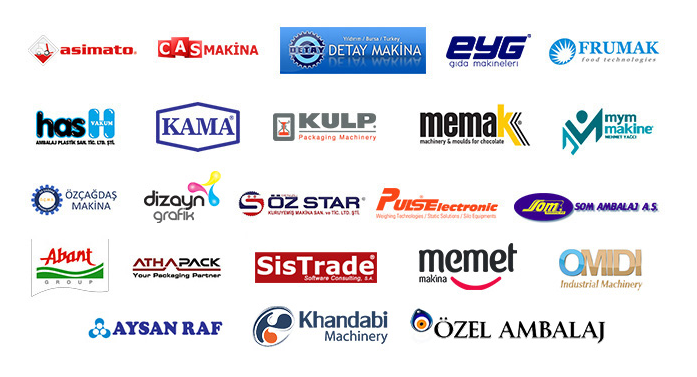 The great meeting of the food industries with the packaging and food service suppliers will be held at CNR Expo Yeşilköy. The exhibition, supported by the Ministry of Economy, will be closely monitored by the most important companies of the world. 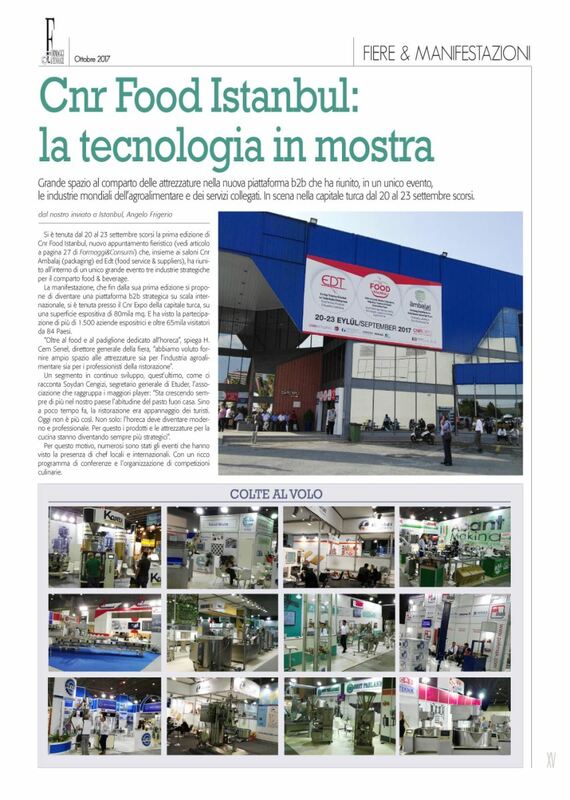 CNR Holding continues its promotion and publicity activities for the exhibition to reach a record-breaking trade volume. 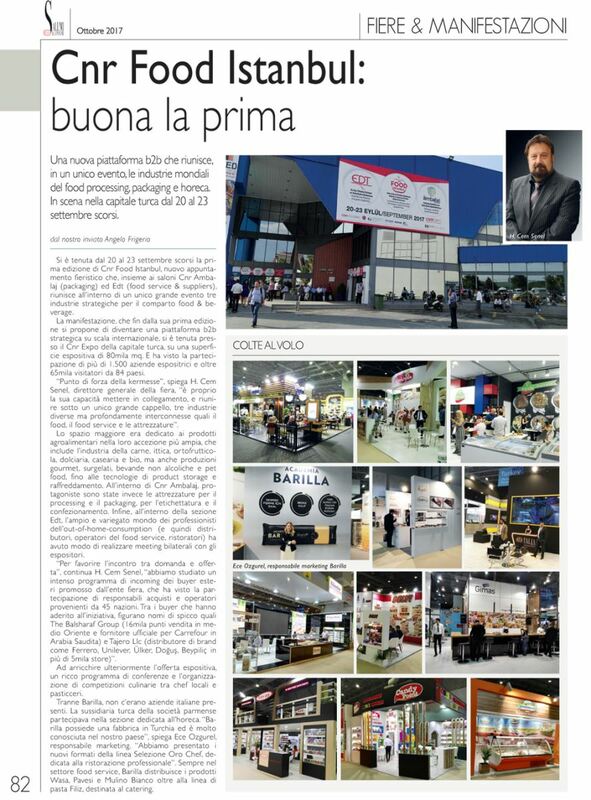 Record-breaking success with 25.000 visitors! 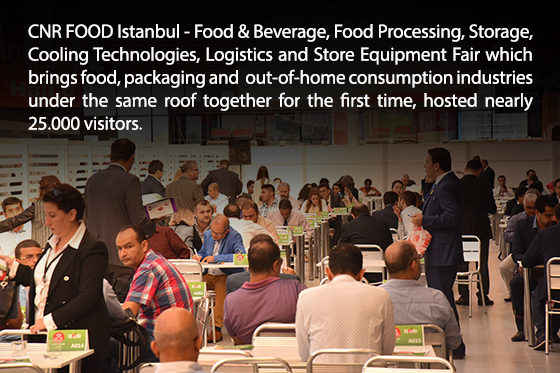 CNR Food İstanbul- Food & Beverage, Food, Processing, Stroge, Cooling Techhonolgies, Logistics and store equipment fair which brings food, packaging and out of home consmption. industriesunder the same roof together for the first time hosted nearly 25.000 visitors. Within the scope of the "International Hosted Buyer Delegation Programme" the exhibitors had the opportunity to meet with the buyers from 45 different countries. Through the B2B matchmaking program, exhibitors which were categorized based on the product groups, had the opportunity to make efficient meetings in terms establishing concrete trade relations with international buyer delegations at the B2B meeting area. 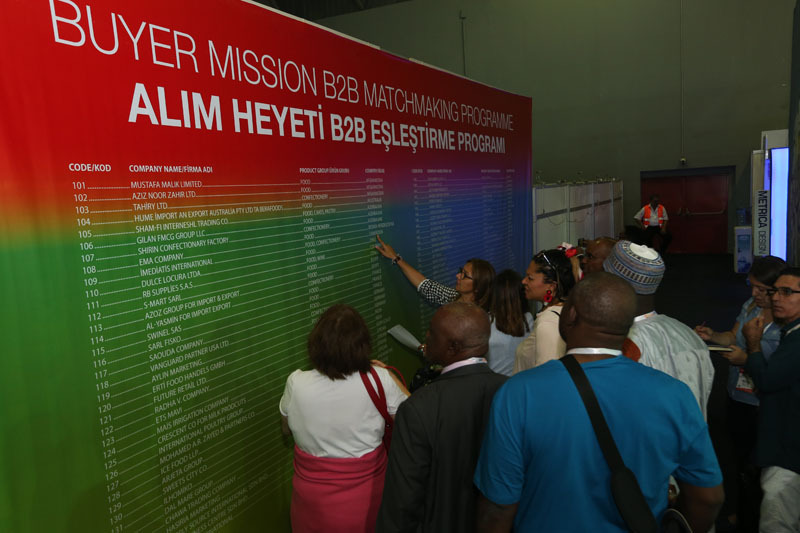 Within the Buyers Delegation B2B Matchmaking Program, more than 500 importers with 4 billion dollars import potential realized over 800 B2B meetings with exhibitors. In addition to international buyer delegations, which were hosted privately, the fair hosted professional visitors from 104 different countries all around the world. The well-known international names such as Ricardo Renzo Rojas, son of Raul Rojas, known as Sugar King and Wayki en Golosinas SAC, the leading producer of Peru candy market, were within the VIP visitor list of the exhibition. 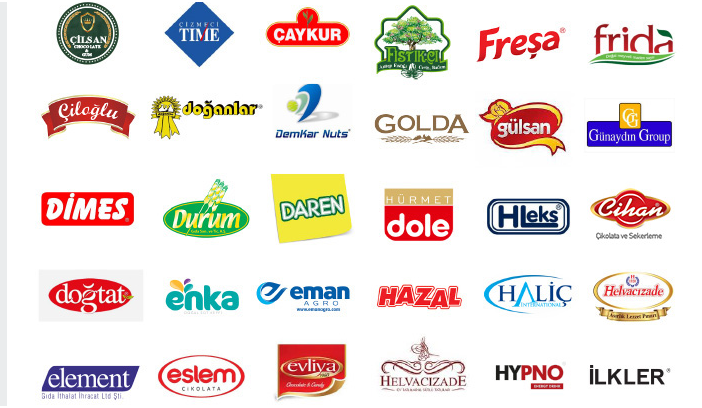 In addition to these companies above, The Balsharaf Group and Tajero LLC were also in the VIP buyer delegations of CNR Food Istanbul. The Balsharaf Group have 16,000 chain stores in the Middle East and provides the supply of Carrefour stores in Saudi Arabia. Tajero LLC distributes the products of companies like Unilever, Ferrero, Ülker to 5000 points. The exhibition hosted well-known international chefs for the cooking shows. 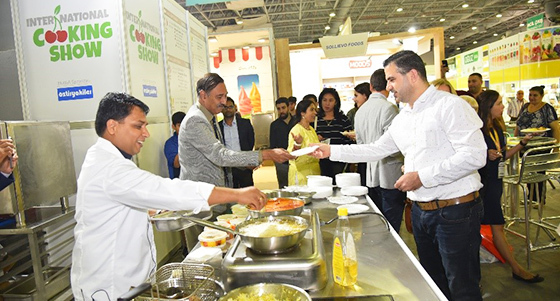 Peruvian cuisine with Bruno Santa Cruz, American Rise Show with Sebahattin Güney, American Cranberry meals with Serkan Çetintas and Indian cuisine with Vinod Kumar Chouhan were on stage while the visitors were experiencing delicious moments during the fair. International chefs voted for the stars of kitchen during the Local Chef, Pastry of Istanbul and Chefs of Future competitions. 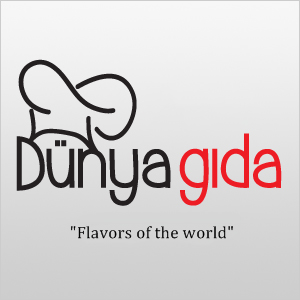 The Local Chef competition, which carried the gastronomy and culinary culture areas further in Turkey, was organized within the scope of the fair. The groups were evaluated from tableware, menus and groceries. Valuable jury members determined the winners. The winner of Local Chef competition was Four Seasons Bosphorus. The second winner was Fairmont Quasar, while the third was Hyatt Regency. Teams participating in the 'Pastry of Istanbul' competition, evaluated in pastry, praline chocolate, sculpture and bakery products. The winner of Pastry of İstanbul was Le Meridien Etiler, The second winner was Movenpick Istanbul, while the third was The Ritz Carlton. The next edition of CNR FOOD ISTANBUL will be held from 5th to 8th September 2018, at CNR EXPO Yeşilköy. Do not miss the region’s most comprehensive event for Food & Beverage, Food Processing, Storage, Cooling Technologies, Logistics and Store Equipment industry! The Federation of Food & Drink Industry Associations of Turkey (Member of Food Drink Europe) has joined the huge cooperation. 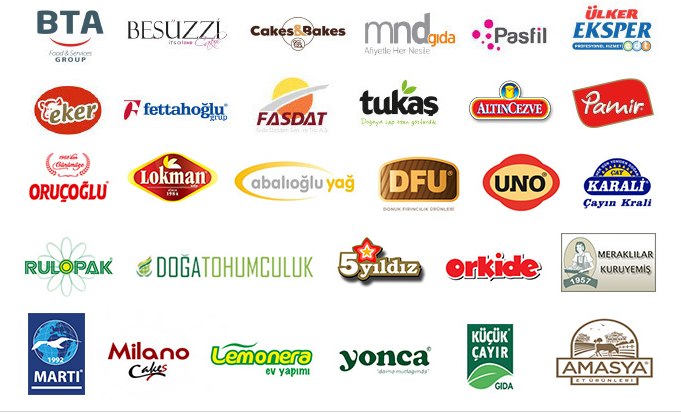 The most important food and beverage industry intuitions of Turkey, Cereals Pulses Oil Seeds and Products Exporters' Association Istanbul, Food Service Products and Suppliers Association and Federation of Food & Drink Industry Associations of Turkey (with its 27 member food and beverage associations) signed a cooperation protocol to fully support CNR FOOD ISTANBUL- Food & Beverage, Storage Cooling, Logistics Technologies & Storage Equipment Fair which will be held on 5 - 8 September 2018 at CNR EXPO together with CNR Ambalaj -Packaging, Labeling & Food Processing Fair. Do not miss the Eurasia Regions’ most comprehensive event for Food & Beverage, Food Processing, Packaging, and Storage industry! Polish Meat Association joins CNR Food Istanbul! Polish Meat Association aims to inform and promote fresh, refrigerated, and frozen beef and beef products. The campaign is targeting the Turkish market. The main aim of the project is to open the market for the European beef and beef products. Moreover, the campaign builds a positive image of the European meat by providing complex information about the products and conducting educational actions. Consulate General of Brazil in Istanbul joins CNR Food Istanbul! As the ambassador of Brazilian Food Industry; Brazilian Chamber of Commerce will be present at CNR Food Istanbul representing Coffee, Soy Beans, Sugar and Meat & Poultry producers in Brazil connecting the purchase power of the region with Brazilian producers. You're invited to this great event! 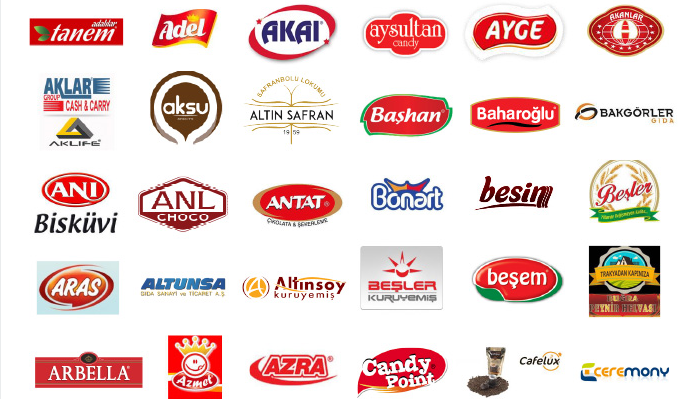 FOOD Istanbul Expo aims to be organized on 60,000 sqm area with more than 1,000 brands targeting 35,000 professional visitors and supported by Istanbul Exporters’Association. Professionals of Food and Beverage industries from Europe, Middle East, North Africa, Russia and Balkans will create new business lead opportunities for Turkish industry. Food Manufacturers, Are you ready to export more in 2018? Turkish food and beverage industry maintains its remarkable position with productivity and dynamism, achieved a success story by having a share of 300 billion US Dollars in total GDP and over 400,000 labor force in 40,000 corporations. FOOD Istanbul Expo positioned as a global b2b meeting point where visitors will get the chance to explore the latest developments and have the general Outlook of industrial diversity. The fair will be a unique business platform that creates a supportive environment for the industry to increase their strength in global competition, to guide them to produce more value-added, innovative, trusted and accredited consumer goods. CNR Food Istanbul exhibition, which aims to become the biggest food fair worldwide, was held on September 5-8, 2018 at CNR EXPO Yeşilköy, with the participation of 1600 brands. 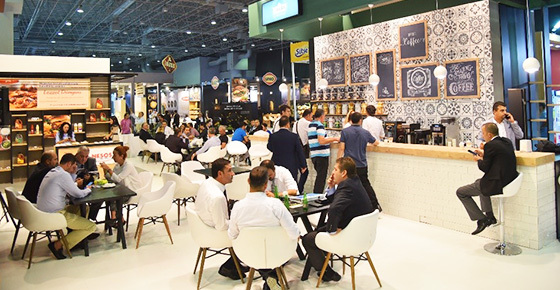 The most prominent names of the Food, Packaging, Foodservice and Suppliers industries exhibited their newest products for 4 days at CNR Food Istanbul. At CNR Food Istanbul, organized with the aim to increase the trade volume of food, food service, and packaging industries, the majority of the exhibitors received orders fulfilling their annual production capacity on the first day of the exhibition. CNR Food İstanbul was organized by Istanbul Trade Fairs, a CNR Holding subsidiary in cooperation with İstanbul Cereals Pulses Oil Seeds and Products Exporters' Association, Ministry of Trade and Istanbul Exporters’ Association, Federation of Food & Drink Industry Associations of Turkey. Czechia, Russia, Uzbekistan, China, and Malaysia participated in the event as pavilions, where professional buyers came together with the exhibitors. 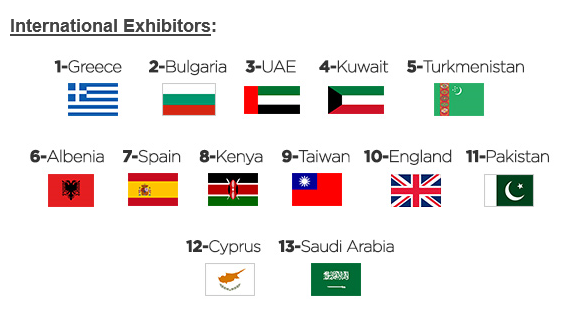 The exhibitors were categorized according to product groups with the B2B matchmaking program, which took place in the first two days of the exhibition, and they were provided the opportunity to have face-to-face meetings with the buying committees in a special area. Business meetings with 350 VIP buyers from 60 countries were organized at the event. 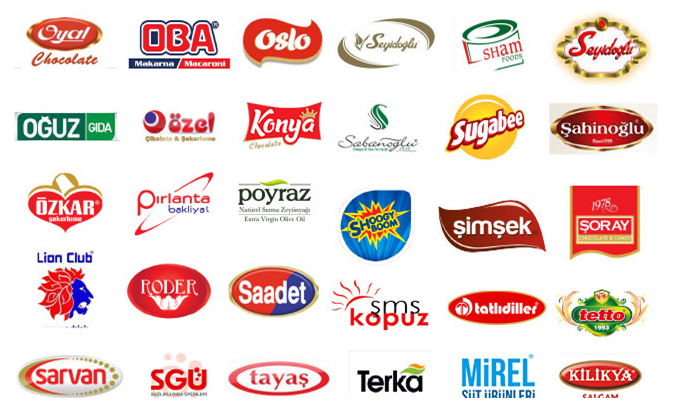 In addition to the international buying committees, visitors from 86 countries contributed to the trade volume of Turkish food companies. 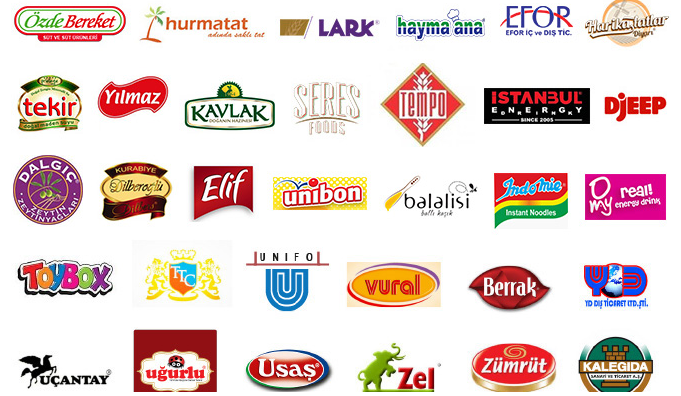 The trade volume of CNR Food Istanbul is estimated to be 2.5 billion dollars. There’s a remarkable increase of 46 percent in the foreign visitor numbers compared to last year. Last year, the 15 percent of CNR Food İstanbul visitors bought online tickets. This year the number multiplied by five and reached 66 percent. CNR Food İstanbul united the most famous chefs as a part of the International Cooking Show, presenting the food and the culture of many countries such as Russia, India, China, Czechia, Taiwan and Malaysia. There was also a panel about increasing the awareness of the producers and consumers in food industry in order to ensure the quality of products.